Miskin was a Mughal artist of the second half of the 16th century. While Bichtr or Ustad Mansur belonged to the court of kahn Jahangir, Miskin painted for the kahn Akhbar, a previous generation from the artists named before. Is in this time when Mughal art begins to take influences from other cultures for painting, without losing its typical symbolism. In this painting we see a gathering of several animals. Up in the peak, we find a raven, almost imperceptible at first look. The animal, symbolically associated with death at the same time with wisdom, address to the rest of the creatures. As we saw in previous posts, the Mughal emperors were very into knowing exotic animals through painting, such as the case of the zebra from Ustad Mansur. 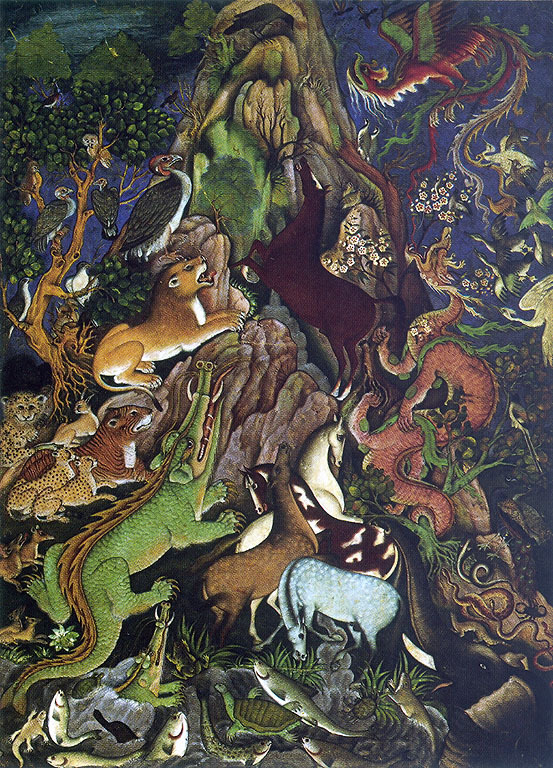 In Miskin’s work, we can also see this intention, through the inclusion of foreign animals from outside the Indian subcontinent, like the cheetahs on the left. But also, with the same value, Miskin include mythical creatures such as the dragon and the phoenix on the right. This painting belongs to the mature work by the artist and it is different from others for the amount of colors he utilizes and for the notorious European influence in the techniques he uses to give the animals volume. ~ by Álvaro Mazzino on January 4, 2011. Another great way to determine which hardware is good is to wrap the chain around your wrist and just see how different colors look on you. Hey, Coco Chanel herself said, “the best color in the world is the one that looks good on you.” I don’t think I should argue with Mademoiselle. The design on this model features a vampire graphic across the black foamposite upper with matching bat logos. Other details include bloody vampire teeth on the heels, red velvet tongues and the lining resembling a coffin’s interior to complete the Vamposite theme altogether. This entry was posted on January 4, 2011 at 09:06 and is filed under Symbolism.You can follow any responses to this entry through the RSS 2.0 feed.You can leave a response, or trackback from your own site.